There is a detailed video on Youtube.com that describes, in detail, how to use the repair kit to fix a tear in a wetsuit or drysuit. You can find it at: https://www.youtube.com/watch?v=4Z5I4_wLtlM You can also find it in the video section of this website. Why should you buy SEASOFT's SeaGLU or SeaGLU Repair Kit? SEASOFT's SeaGLU™ is the the adhesive used by the world's best manufacturers to make their wetsuits and other neoprene products. It is simply the best. We have been using this adhesive here at SEASOFT for more than 20 years and we know you will have the same success we do. SeaGLU™ is an easy to use and quick to set up adhesive that works with all watersport neoprene. From Bruce Justinen, president of SEASOFT SCUBA, "More than 20 years ago I was diving in Canada and tore my neoprene drysuit. A fellow diver handed me a jar of black neoprene glue and I repaired my suit. I was amazed at how easy it was to use and how fast it cured. Now a couple of decades later this Canadian company is recognized as the premier manufacturer of wetsuit and drysuit glues in the world. Having made continuous upgrades to their glues over that long period of time their glues are used by most of the best wetsuit and drysuit companies. 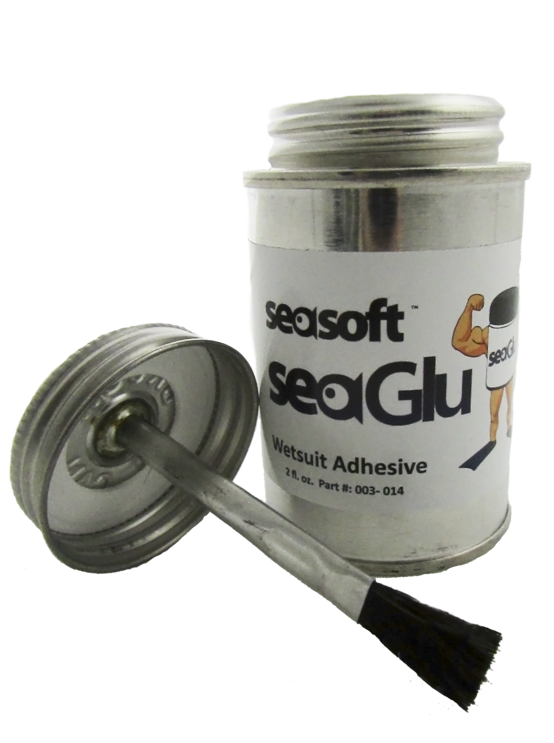 We now are selling that same wetsuit adhesive: SeaGLU™ is available for YOUR repair." SeaGLU™ is a fantastic adhesive that comes packaged in a metal container with an integrated brush built into the handle. SeaGLU™ has a long shelf life due to the metal container that does not allow the glue solvents to migrate through the walls like they do in plastic containers. Just keep the lid tightly closed. 003-015 REPAIR KIT - SeaGLU™ 2 oz. Wetsuit, Seal and Neoprene Adhesive with a 6" x 6" 3.5 mm high quality neoprene patch. You can also find it in the video section of this website. HINTS FOR USING SEASOFT'S SEAGLU™. 1. Always use in a well-ventilated area. 2. Clean up with "Laquer Thinner" or nail polish remover in a pinch. 3. All glues are flammable, be extremely careful around flames and do not smoke while using SeaGLU™, have a large fire extinguisher at your side. 4. SeaGLU™ dries in minutes so it is wiser and more efficient to do small areas at a time. 5. If you are not sure how to do a repair then you will have much better results referring your repair to professionals. 6. When a repair starts going "sideways" on you the best thing to do is to STOP! Let the glue dry. Pack everything up. See the local professionals with experience. 8. If the lid is not sealed TIGHTLY your SeaGLU™ will dry out and is not covered by any warranty!